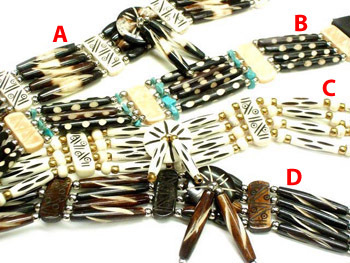 These 4 line chokers are made from genuine buffalo bone. They are decorated with silver plated beads and bone spacers. Complete your breastplate regalia outfit with one. Depending on style, some have center pendants made from bone and bone fluted hairpipe. Length - 11 3/4" x Width 1 3/8". Two tie on straps- Length 4".